Tuck Miller, NZ6T, got into ham radio in August of 1991. Wasting little time, he became active with the Amateur Radio Emergency Service (ARES), where he held both an Assistant DEC position, and then became the District Emergency Coordinator for San Diego’s Southern District. Tuck also accepted the positions of Affiliated Club Coordinator, Public Information Coordinator, and Official Observer Coordinator. In 1996, Tuck was appointed to the ARRL WRC99 committee, which proposed new, changes to the Amateur Radio Structure. He was asked to become Assistant Section Manager under the tenure of Pat Bunsold, WA6MHZ. He was the elected Section Manager in April 1998, and re-elected in April 2000. 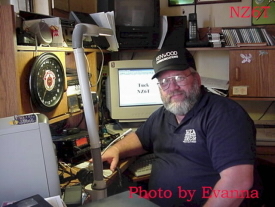 Tuck has been President of the Southbay Amateur Radio Society (SOBARS) since 1997, and also for the Amateur Radio Club of El Cajon for the years, 1996, 1997, and now for the year 2000. Tuck was a Danville, Illinois firefighter before coming to San Diego, where he is now a Train Operator for the San Diego Trolley. He gained a bit of broadcast experience, while serving aboard the USS John F. Kennedy, where he was a DJ for the ships radio station. Also included was a short stint with a Danville radio station as a new reporter. Tuck is married to Evelyn, N6EVE, has 2 daughters, and 2 grandsons. He also held Amateur calls KC6ZEC, K6ZEC,NZ6T, and W3TM. Enjoys Euchre.